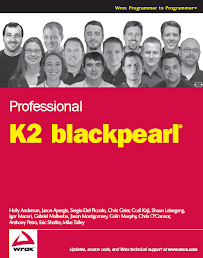 I just finished another install of K2 BlackPearl and ran into a couple things I had not run into in the past that you should know about. You either need to un-install .Net 3.0, install the extensions and then upgrade to .Net 3.0 SP1. This was weird. We installed Microsoft Report Viewer Redistributable 2005 and then got an error in the K2 Workspace when trying to access Reporting Services saying we need to install Microsoft Report Viewer Redistributable 2005 SP1. We down loaded Microsoft Report Viewer Redistributable 2005 SP1 (Full Installation) but that would never work. The solution was to install Microsoft Report Viewer Redistributable 2005 then install Microsoft Report Viewer Redistributable 2005 SP1 (Upgrade). The upgrade is referenced in the Getting Starting document but the original distributable is not. The Getting Started document mentions this but do not forget to configure the DTC security configuration on SQL Server, the K2 Server and possibly on the MOSS server if MOSS and K2 on different machines. You will run into deployment issues if it is not configured on each machine.